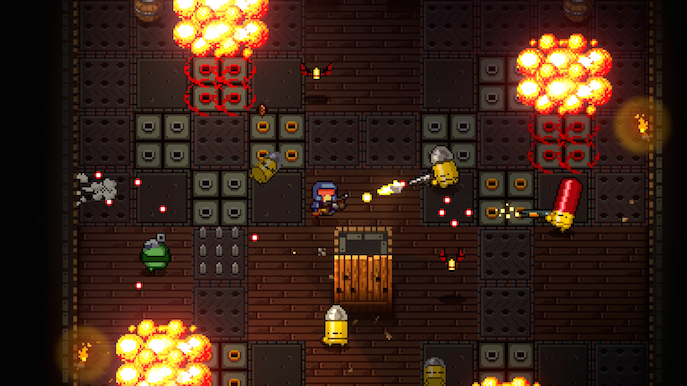 Dodge Roll developers with the help of Devolver Digital bring us the gunfight dungeon crawler that involves adventuring, a small character cast, but a bunch, and I mean a bunch…of guns. GUNS, UNS, GUNS! No, this isn’t an inside joke from Borderlands. 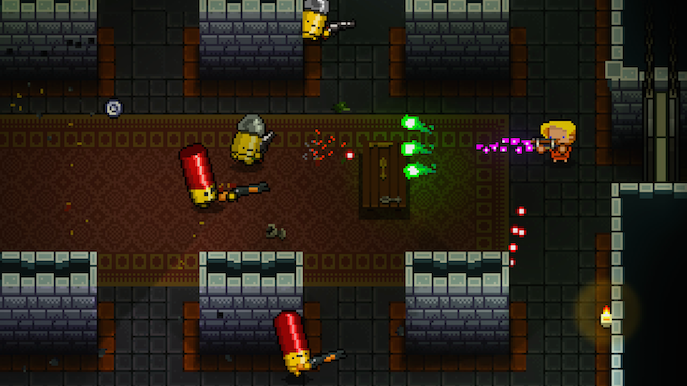 Enter the Gungeon features a wide variety of guns. It’s biggest perk by far to say the least. This factor balances the element of having a small character roster which honestly either way feels quite a bummer to have only a few to play as. Nevertheless, players can enjoy this game for hours, and still be rewarded with new weapons with new gimmicks and shenanigans. Most weapons have predictable names, giving player and easy idea of what it does. However, some have strange names that only by hitting that trigger will you realize the epic experiences you’re about to get. 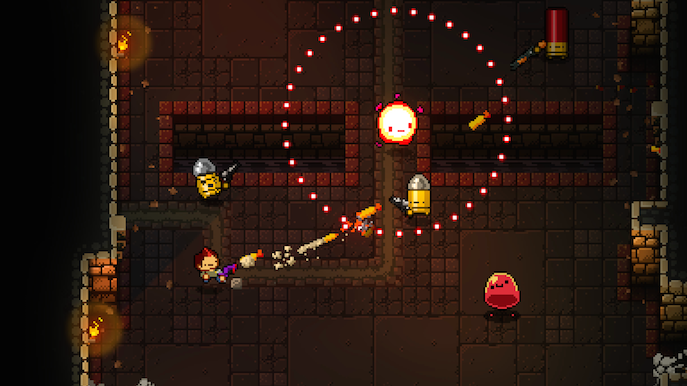 The game obviously revolves around the whole idea of progressing through the Gungeon with a much diverse equipment as you can, but it also balances how you get ammo if you like to keep specific weapons. When obtaining ammo, once looted you will recharge your currently equipped weapon, so keep that in mind for your preferred weapons. 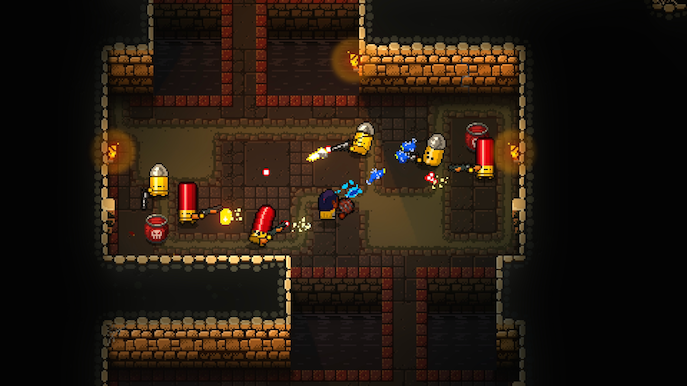 Enter the Gungeon gives a fresh look at dungeon crawling roguelikes. Usually this genre revolves around the idea of starting over but with a sense of progression given to the player, either by unlocking some rewards, or plain experience and practice, but the fact that the character would come back? Usually is something not quite explained? Not in this case though! 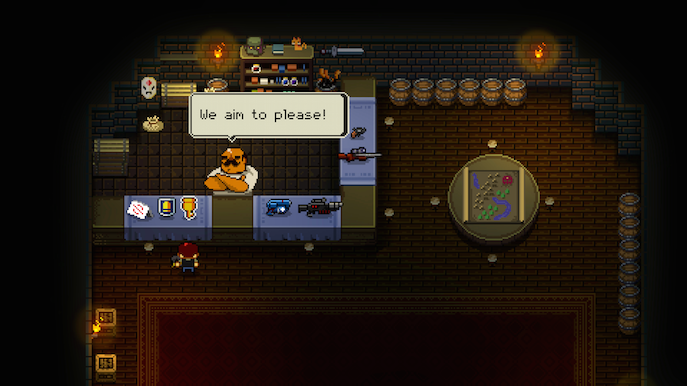 Enter the Gungeon’s plot tells of “a gun that can shoot past events.” So when ever your characters gets owned, it shoots and you come back to shoot once again, everything should be explained once you have successfully raided the whole Gungeon. 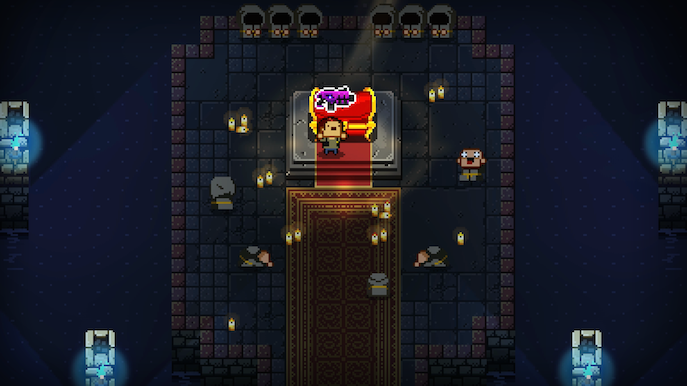 Once in the Gungeon, you must explore enough rooms until you find the boss room and feel confident to confront it. 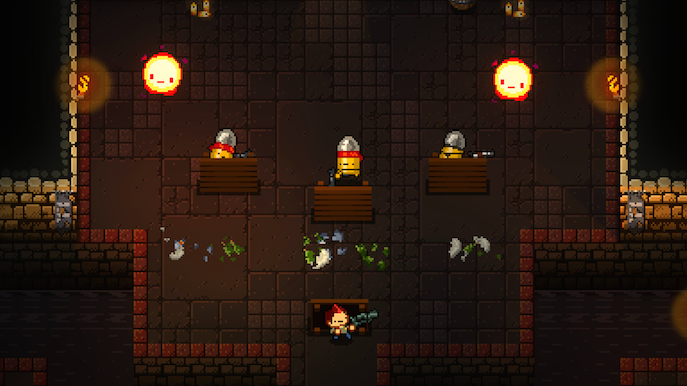 During your gungeoning, you can find treasure chests with guns, which can be unlocked by keys. You can also find the classic shopkeeper; find and rescue base NPCs and play mini games. Also you can interact with the environment to help you during gun fights, such as turning tables over and using them as cover! Pretty much. Some enemies are bullet shells, teleporters are revolver bullet holes, the elevator is a giant bullet, etc… Some players might think this is a bit too much of a bit on the nose, while others may consider it to be quite clever as the amount of “jokes” is quite high. 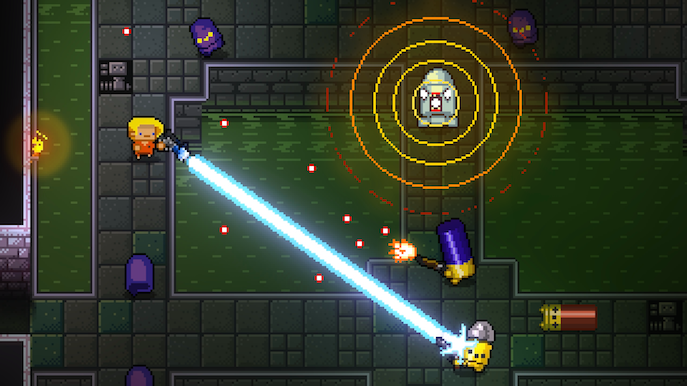 Gungeon decorations and overall environments usually look a bit different from this theme, but only on general terms. The aesthetic itself appropriates the guns theme quite impressively nevertheless. The pixel quality of the game gives it an interesting charm that really works around this genre. Of course imagine how awesome this would be if it explored other visual techniques. The color palette is very diverse and very appropriate for the amount of content the game has to offer, both on weaponry and environments. The game offers loads of fun, enables and rewards persistence, patience and concentration. Not to mention is one of the most entertaining roguelikes out there currently. + Thematically appropriate visuals and music.